Yet another barbecue influenced flavor from Herr's. This one without snazzy and extravagant graphics. 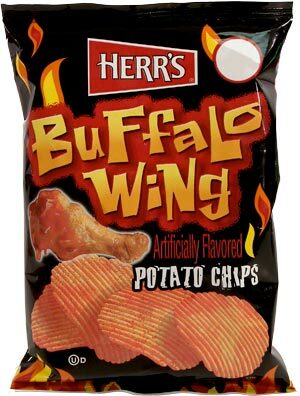 Instead, this packaging features a few cartoon flames, the mandatory Chips image, plus a chicken leg with some sauce floating around in the middle somewhere. The bag design is however, modern, bright and noticeable. A decent crispy crunch. The Chips were not brittle at all and did turn to mush not long after a bit of a chew, but overall an average to good quality thickness of crunch. The bag promised narrow Ridged Chips. The content featured the usual wide Ripples familiar with Herr's. We won't make a big fuss about it though, most were intact and the edges were crisp and not flaky. There was a good amount of seasoning evenly coating a rather random potato slice; some were yellow and fresh looking, a few were brown and over-cooked looking. Sweet and tangy were immediately the first two words that sprang to mind after an initial handful of these Chips. We did not find it immediately identifiable with any sort of buffalo wing sauce we were familiar with, but if the flavor was on a piece of chicken we would happily eat it.